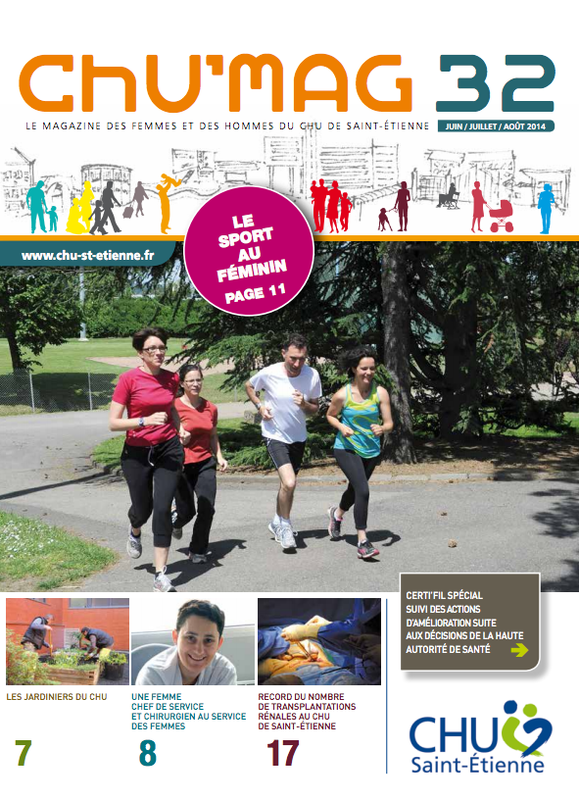 The March edition of the FNM newsletter includes a feature on PanCareLIFE. The article describes how the paradigm in childhood oncology has changed from acute care to cure cancer to chronic care, where there is a focus on cure but also on prevention of late effects and their lifelong, informed management. Lifelong management relies on systematic research in late effects, like that conducted in PanCareLIFE, as well as sophisticated systems of care transition for adult survivors and empowering survivors to co-manage their own care through initiatives like Together to Smile in the Czech Republic. You can read more in Czech here. 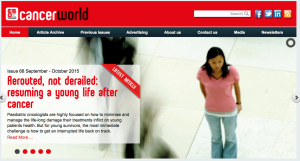 PanCareLIFE and the PanCare network were highlighted in a recent article in Cancer World, ‘Rerouted, not derailed: resuming a young life after cancer’. There is no place for competition in paediatric oncology. We all work in a team. The PanCare network summarises this spirit: cooperation. The increase in the childhood cancer cure rate has been dramatic over the past twenty years. We now have more children who survive than who die. But what happens to them when they walk out the doors of the ‘Kinderonko’, when they’re finished with their treatments? The price of their recovery remains very high. Through research into the late effects of cancer treatment PanCareLIFE aims to ensure that survivors of cancer diagnosed before age 25 enjoy the same quality of life and opportunities as their peers who have not had cancer. 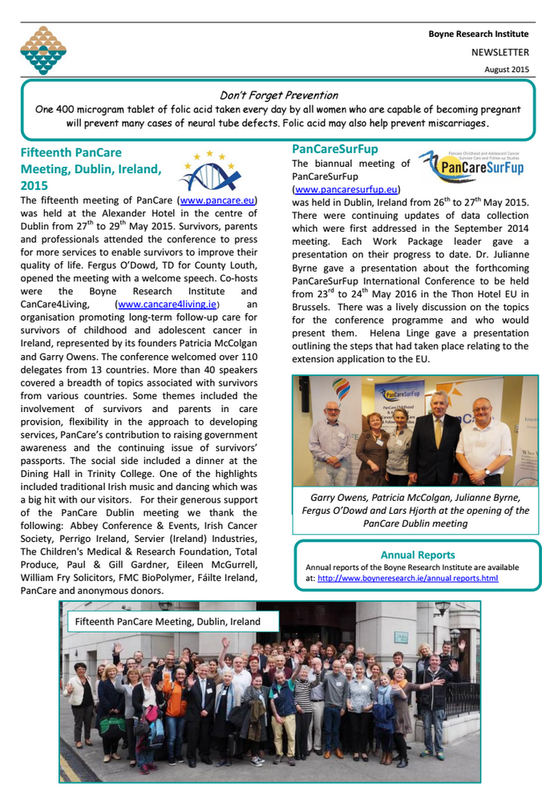 Read more about PanCareLIFE, PanCare and PanCareSurFup in the recent newsletter from the Boyne Research Institute. PanCareLIFE has been featured in CHU’MAG Ed. 32, June / July 2014. A one page .pdf extract of the article can be found here. 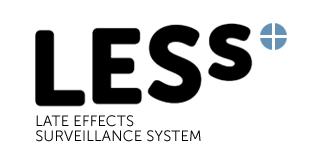 PanCareLIFE was featured in the March 2014 edition of the German Society for Paediatric Oncology and Haematology Late Effects Surveillance System (GPOH LESS) newsletter. dem damaligen Direktor des Instituts für Medizinische Biometrie, Epidemiologie und Informatik (IMBEI), gegründet und wurde von Beginn an am IMBEI geführt (Direktorin: Prof. Dr. Maria Blettner). Seit dem Jahr 2001 liegt die Leitung in den Händen von PD Dr. Peter Kaatsch.